Staffed by a highly qualified Plastic Surgeon, Cosmetic Physician, Registered Nurses and a skin therapist, the Infinity Skin Clinic has the best lasers and medical grade skin products on the market today. The Infinity Skin Clinic was established by leading plastic surgeon Dr Charles Cope to provide clients with professional advice on the latest skin care and aesthetic treatments to give you fresher, healthier and younger looking skin. We offer initial assessment of your skin with all new 7th Generation VISIA Complexion Analysis System to advise on your skin care needs in a professional, caring and relaxed environment. 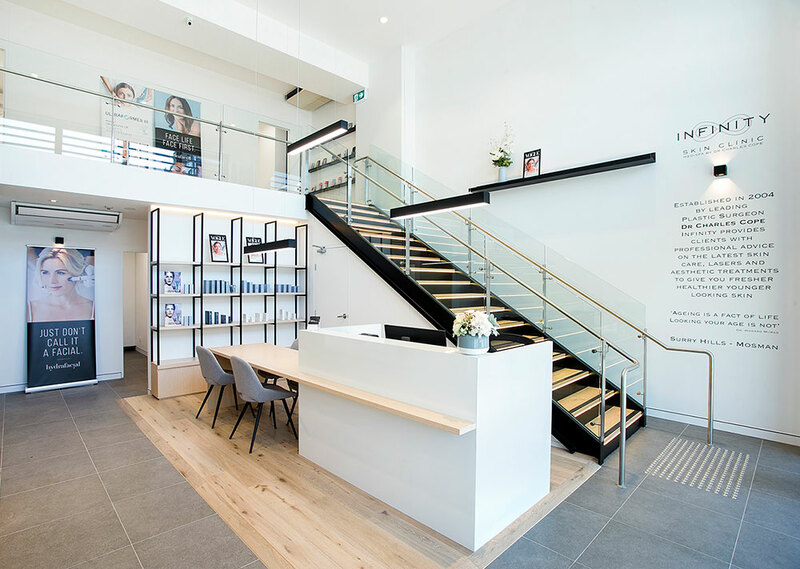 Staffed by a highly qualified Plastic Surgeon (Dr Charles Cope), Cosmetic Physicians (Dr Jake Sloane & Dr Michael Berger), Registered Nurses and Medical Aestheticians, the Infinity Skin Clinic has the best lasers and medical grade skin products available. The clinic's beautiful, state-of-the-art rooms are located on the lower North Shore at Mosman with secure underground parking, and our new clinic is opening on Crown St in Surry Hills in October 2018. Our lasers include the revolutionary, medical grade Fraxel® Re:store DUAL laser, HALO and DUALMODE laser resurfacing, which improves skin texture of the face, neck, décolletage and back of the hands. This laser treats sunspots and wrinkles, and are also the most effective laser available to treat acne scarring. Infinity uses the Thermage®, SkinTyte™ and Ultraformer III, for skin tightening which improves skin laxity without surgery or injections. Anti-wrinkle and facial filler injections for facial contouring are administered by qualified, experienced Cosmetic Physicians and Registered Nurses with over 10 years of experience in injecting. The Infinity Skin Clinic specialises in achieving a natural looking result that is subtle yet rejuvenating. Infinity offers a wide range of other services including the ForeverYoung BBL program, Hydrafacial, Omnilux™ Combination Light Therapy, Healite II LED therapy, Medical-grade peels and skin-care, IPL Photorejuvenation, MDerma Dermal Needling therapy, Laser Genesis, Migraine and Hyperhydrosis treatments, as well as Laser Hair Removal.